Riding on Rohit Padbanaban Sharma's maiden fifty and RP Singh's four-wicket haul that wrecked South Africa, a spirited India spanked the hosts by 37 runs to storm into the semifinals of the Twenty20 World Cup here tonight. An angry exchange of words with Andrew Flintoff fuelled Yuvraj Singh’s fury as he smashed six sixes in an over off Stuart Broad in the Twenty20 World Cup Super Eights match against England here last night. India beat Pak 3-0 — in cricket! A dominating display by Australia saw them thrash Sri Lanka by 10 wickets in a Super Eight match and enter the semifinals of the Twenty20 World Cup at Newlands here today. The Australian cricket team breathed a huge sigh of relief today when captain Ricky Ponting was cleared for the upcoming seven-match one-day series in India.However, it is not certain whether Ponting would be able to play in all matches in India and Brad Haddin has been added to the touring party as cover. Debutant Junaid Siddique’s sparkling 71 went in vain as a lackadaisical Pakistan, with a ticket to the semifinal already in their pocket, tamed Bangladesh by four wickets in an inconsequential match of the Twenty20 cricket World Cup here today.Junaid’s 49-ball 71 (6 fours, 3 sixes) was the highlight of the Bangladesh innings after the minnows were asked to bat first by Pakistan captain Shoaib Malik. Dharamsala is known for its unpredictable weather which can undergo an abrupt change within no time. It was no different on the second day of the four-day match between India ‘A’ and South Africa ‘A’ at the HPCA Stadium here today. Viswanathan Anand defended skilfully as he split the point with Hungarian GM Peter Leko to remain in the lead after the sixth round of the World Chess Championship here. Nineteen-year-old Nitika Jadeja of Rambagh Golf Club, Jaipur, took a one-stroke lead over India’s top lady golf professional Simi Mehra, returning a two-over card of 74 on the penultimate day of the DLF Women’s Professional Golf Tour on the par-72 greens of the Chandigarh Golf Club here today. 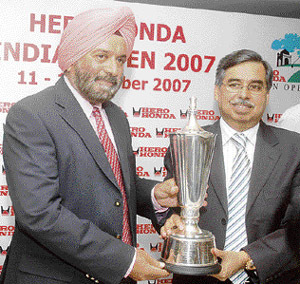 Jeev Milkha Singh and defending champion Jyoti Randhawa will be the star attractions in the $500,000 Hero Honda Indian Open Golf Championship to be held at the Delhi Golf Club course from October 11 to 14. India’s Mangal Singh Champia has booked a berth for the Beijing Olympics in men’s recurve individual event by winning bronze in the 15th Asian Archery Championship which concluded at Xian, China, today. The last flicker of hope of an Indian challenge was snuffed out by Britain’s Anne Keothovang who mauled Sunitha Rao in straight sets 6-3, 6-2, even as second seed Daniela Hantuchova sailed through to the second round at the WTA Sunfeast Open here today. Jose Mourinho’s three-year reign at Chelsea came to an abrupt end today as the Portuguese manager’s fraught relationship with the club’s Russian owner, Roman Abramovich, finally reached breaking point.An announcement that will send shock waves through English and European football came in the early hours of the morning with Chelsea claiming that Mourinho had left “by mutual consent.”A terse statement posted on the London club’s website stated: “Chelsea and Jose Mourinho have agreed to part company today by mutual consent. Sanjo Devi, a student of local Government Post-Graduate College, has won the gold medal in javelin throw at the 47th National Senior Interstate Athletics Championships 2007 being held at Tantya Tope Nagar stadium in Bhopal on Wednesday. Jammu and Kashmir will host its maiden National Wrestling Championship (junior) starting here tomorrow, sports minister Babu Singh said yesterday. The three-day event will be held at the Sher-e-Kashmir indoor stadium. The 39th Haryana Police Games will be held from September 21-23 at Vachher Stadium, Madhuban. About 400 sportspersons from seven ranges of Haryana Police will participate in handball, kabaddi, volleyball, basketball, shooting and golf competitions. India’s men’s hockey team have been allotted comparatively easier group and ranked at number eight for qualifying tournaments for the 2008 Beijing Olympics.According to Indian Hockey Federation (IHF) secretary K. Jyothikumaran, India will play the qualifying tournaments from March 1 to 9 in Chile and will take on Britain (ranked 9), Egypt (ranked 18), host Chile (ranked 20), Austria (ranked 25) and Bangladesh (ranked 28). With this defeat, South Africa crashed out of the tournament with New Zealand making it to the semifinals on better run rate. India will now meet Australia in the first semifinal on Saturday, while New Zealand meet Pakistan in the second match the same day. Batting first, India survived a top order collapse to score 153 for five with RP Sharma (50 not out) and Mahendra Singh Dhoni (45) propping up the innings. In reply, South Africa could manage only 116 for nine with Albie Morkel and Mark Boucher contributing 36 each. Defending a not-so-impressive target, Indian bowlers decided to have a go at the hosts and RP Singh led the way with a two-wicket burst in his first over. His first delivery trapped Herschelle Gibbs (1) and the fourth delivery kissed Graeme Smith's blade before nestling into the gloves of an airborne Dinesh Kaarthick, who dived full length to his left to pull off an absolute stunner. South Africa slumped to 12 for two and the worse was yet to come. Sreesanth then joined the party and AB de Villiers was beaten by the pace as the delivery struck his pad in front of the wicket and Simon Taufel had no qualms upholding the appeal. Lot depended on Justin Kemp (5) but Rohit Sharma's brilliant piece of fielding meant it was not to be his day. Boucher had pushed it to off-side and set out for a single when the fielder swooped on the ball and broke the stumps with a direct hit with Kemp yet to make his ground. And it was double whammy in the sixth over as RP Singh crashed the fifth delivery through Shaun Pollock's (0) gate as the hosts lost top half of their batting order with the score reading a mere 31. Boucher (36, 41b, 4x4) and Morkel (36) stemmed the rot with Boucher hitting Harbhajan Singh for three fours in a row in the 13th over. 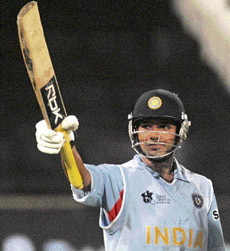 However in the 17th over, Boucher dragged a Sreesanth delivery onto his stumps to end the 69-run stand and Harbhajan had Vernon Philander stumped in the next over. Fall of wickets: 1-32, 2-33, 3-33, 4-61, 5-146. Bowling: Pollock 4-0-17-2, Ntini 4-0-30-1, Van der Wath 4-0-43-0, M Morkel 4-0-32-1, Philander 2-0-14-0, A Morkel 2-0-13-0. The 25-year-old left-hander’s breathtaking exploits also earned him a place in the record books alongside Sir Garfield Sobers, Ravi Shastri and Herschelle Gibbs besides, of course, piloting India to an 18-run victory over England last night. “It’s a great feeling. To hit six sixes in an over of a main bowler, thank God for helping me achieve that!” said Yuvraj Singh. After Delhi duo Virender Sehwag (68 from 52 balls, 4 fours,3 sixes) and Gautam Gambhir (58 from 41 balls, 7 fours, 1 six) laid the foundation with an opening stand of 136 runs, Yuvraj (58 from 16 balls, 3 fours, 7 sixes) lit up the stadium with the fastest fifty in Twenty20 that came off just 12 balls and included three fours and six sixes. In reply to India’s imposing 218 for four, England managed 200 for six wickets, with Vikram Solanki scoring 43 for them and Kevin Pietersen contributing 39. In his moment of reckoning, Yuvraj recollected the agony he had to endure precisely two weeks ago in England when Dimitri Mascarenhas hit him for five consecutive sixes in the final over at the Oval in the sixth one-dayer. “After I was hit for five sixes, I had so many phone calls. I never got that many calls after I got a hundred, but there were about 150 calls and sms with people making fun of me. So I said, 'Oh God, this is not right, you got to give it back to me.' And he gave it to me today!” he recalled. And a few verbal volleys from Flintoff last night set Yuvraj Singh’s competitive juices flowing as he looked to prove a point to the celebrated England all-rounder. Asked when he thought it was possible to hit six sixes in a row, Yuvraj said it was after he sent the fourth one out of the park. “I just concentrated on watching the ball and play straight and I connected all six. I think he (Broad) was looking for the yorker on the fourth but it was a full toss and I connected well. I was using the crease so that I could convert the yorker into a volley and hit it for six. I timed it very well,” he explained. In his moment of glory, Yuvraj had a sympathetic word for young Broad. “I was the one who was hit for five sixes (at the Oval) and it’s a horrible feeling. And I'm not even a (regular) bowler. Stuart (Broad) is their front line bowler and I feel sorry for him," he said. Having added a golden chapter in the history of slam-bang cricket, Yuvraj, to everyone's surprise, Yuvraj replayed each of his big hits. "The first one was the longest one at long-on. The second was at backward square. Third one was over long-off. Fourth one was over point. Fifth one was a mis-hit over mid-wicket, and sixth one again was long-off!" Nothing went right for the Lankans as the Australians, who were missing skipper Ricky Ponting due to a hamstring injury in the knockout game, bowled out Sri Lanka for a mere 101 in 19.3 overs before achieving the target in 10.2 overs. Matthew Hayden (58 off 38 balls, 7x4, 2x6) and stand-in captain Adam Gilchrist (31 off 25 balls, 4x4) quickly knocked the stuffing off the bowlers, hitting them all round the park. Hayden gave the finishing touches to a dominating all-round performance by hitting Jehan Mubarak for six over mid-wicket to seal the victory. Australia became the second team after Pakistan to enter the last-four stage from Group F.
Gilchrist won the toss and put Sri Lanka in, and his pacers, led by Stuart Clark (4-20), did not release the Lankans from their vice-like grip, dismissing them for the fifth lowest score in Twenty20 international cricket. Brett Lee started the rot trapping Sanath Jayasuriya lbw for a duck in the first over and the wickets kept falling with monotonous regularity as Mahela Jayawardene’s side slumped to 43 for seven at one stage. Kumar Sangakkara (22 off 23 balls) was the only top-order batsman to get into double figures. Only an eighth-wicket stand of 40 between Jehan Mubarak (28 off 26 balls) and Chaminda Vaas (21) gave them a semblance of respectability, but it was never going to be enough. Apart from Clark, Nathan Bracken (2-14) and Lee (2-27) ensured that the Lankan innings never recovered from the initial setbacks. The only sore point for the Aussies could be a possible injury scare for all-rounder Shane Watson, who had to go off the field in the middle of an over for what looked like a hamstring problem. 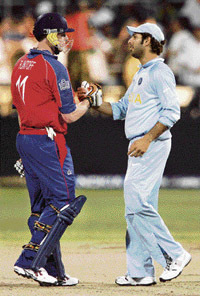 Watson was playing his first match in the tournament after recovering from injury and had taken the place of Ponting, who has been ruled out for the rest of the tournament. It was a must-win situation for both teams and the Australians were at their professional best with the ball and in the field. The pitch was offering some assistance and the new ball bowlers took full advantage. Their clever change of pace and length had the batsmen in all sorts of trouble as they repeatedly holed out going for aerial shots. However, the Lankans also contributed to their own downfall by playing reckless shots and not applying themselves. Upul Tharanga, Jayawardene, Chamara Silva and Tillekaratne Dilshan got out to poor shots as they went in search of quick runs and perished. The bowling was complemented by top-class fielding as was evident by the catch taken by Michael Clarke at point to dismiss Farveez Maharoof off the bowling of Clark. Fall of wickets: 1-1, 2-9, 3-11, 4-21, 5-30, 6-43, 7-43, 8-83, 9-99. Bowling: Lee 4-0-27-2, Bracken 3.3-0-14-2, Johnson 4-0-18-0, Clark 4-0-20-4, Watson 3.2-0-19-1, Symonds 0.4-0-2-1. Bowling: Vaas 2-0-21-0, Fernando 3-1-12-0, Maharoof 2-0-34-0, Dilshan 2-0-13-0, Malinga 1-0-8-0, Mubarak 0.2-0-8-0. The Australian cricket team breathed a huge sigh of relief today when captain Ricky Ponting was cleared for the upcoming seven-match one-day series in India. However, it is not certain whether Ponting would be able to play in all matches in India and Brad Haddin has been added to the touring party as cover. Cricket Australia's National Selection Panel (NSP) confirmed that Ponting, who suffered a hamstring strain during the ongoing Twenty20 World Cup in South Africa, would remain in the squad for the tour of India. The right-hander was, however, ruled out of any further participation in the Twenty20 tournament. Ponting would continue his rehabilitation in South Africa before departing with the rest of the Australian squad next week, NSP chairman Andrew Hilditch said. “Ricky Ponting is making excellent progress following his hamstring strain in the game against Pakistan on Tuesday. Ricky will be coming on the tour of India and will resume playing as soon as he is medically cleared,” Hilditch was quoted as saying in a Cricket Australia release. Debutant Junaid Siddique’s sparkling 71 went in vain as a lackadaisical Pakistan, with a ticket to the semifinal already in their pocket, tamed Bangladesh by four wickets in an inconsequential match of the Twenty20 cricket World Cup here today. Junaid’s 49-ball 71 (6 fours, 3 sixes) was the highlight of the Bangladesh innings after the minnows were asked to bat first by Pakistan captain Shoaib Malik. Bangladesh were all out for 140 runs with two more deliveries to go. Chasing 141 for a win, Pakistan hardly looked convincing even though they managed to reach the target with one over to spare. Shahid Afridi, opening the innings, top scored with a 15-ball 39 that included two sixes and five boundaries, while Imran Nazir, hit in the groin by Mashrafe Mortaza’s third delivery, returned to remain not out on 27. After Nazir returned for treatment, Afridi and Mohammad Hafeez (23) were going great guns and the duo added 59 runs inside six overs when Syed Rasel had Hafeez caught by Tamim Iqbal. Hafeez, who made 23 off 21, was caught in the deep of Syed Rasel. Left-arm spinner Abdur Razzaq got the vital wicket of Afridi as Pakistan slipped to 69 for three. Bowling: Asif 4-0-26-1, Tanvir 3-0-27-0, Afridi 4-0-25-1, Hafeez 3-0-27-2, Gul 3.4-0-17-1, Malik 2-0-15-2. Fall of wickets: 1-59, 2-66, 3-69, 4-102, 5-106, 6-119. Bowling: Mortaza 4-0-45-1, Rasel 3-0-34-1, Razzak 4-0-16-2, Shakib 4-0-17-0, Mahmudullah 4-0-28-1. Overnight rain meant that the match would not get under way at the scheduled time. 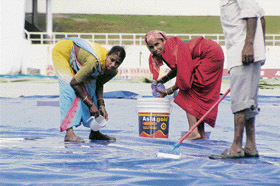 Hectic efforts by ground staff raised hopes of the match starting at least after the lunch break. But as things looked to be heading in the right direction, weather suddenly took a turn for the worse around 11 am. The heavy downpour that lasted for a little less than half an hour washed out any hopes of play today. The ground staff immediately swung into action again and covered the pitch area, but the showers were strong enough to leave puddles of water near the boundary areas. Though the mopping-up operations continued after the rain stopped and Super Sopper was pressed into service to flush out the rainwater, the ground was too soggy. The match referee did not take long to call off the day’s play around 2 pm. Talking about the disruption in the play due to rain, an HPCA official said they had enough covers to keep at least 70 per cent of the ground area water-free. He said this much area of the ground was dry, though the rest could be problematic. He lamented that another Super Sopper imported from Australia could not reach the venue in time. “The new one would have flushed out at least double the amount of water that is being done by the one already in service,” he said. South Africa ‘A’ finished the opening day’s play yesterday at 264 for 4 after the pre-lunch session was lost due to a moist outfield. The visitors’ batsmen showed positive intent right from the start and did not waste much time in scoring runs. Opener Alvira Petersen notched up a superb century, while Hashim Amla and skipper Boeta Dippenaar had useful knocks under their belts. The continued disruption of play is a setback for in-form players like Akash Chopra, S. Badrinath, skipper Mohammad Kaif and left-arm spinner Pragyan Ojha. In his quest to regain a berth in the Test squad, Chopra had scored an unbeaten double century in the first match of the series in New Delhi as the visitors crashed to a humiliating defeat. It was Ojha who, among the bowlers, played a key role in the victory in the series opener. Probably the best bowler from the India ‘A’ side yesterday with two key scalps, Ojha would only be too keen to see play resume so that he could add to his tally. It must have been disappointing for Bhupinder Singh Sr, BCCI’s North Zone selector, to see large-scale mopping-up operations in the ground at the time when he reached the stadium, instead of young aspirants in the thick of action against a highly competitive side like South Africa ‘A’. The draw, however, allowed Israeli Grandmaster Boris Gelfand to catch up with Anand at the top after beating Russian Grandmaster Alexander Morozevich. Anand and Gelfand have four points from six games and have a slender half-point lead over their nearest rivals. Anand faced the Spanish opening in his game against Leko and he replied with the Archangelsk variation. He sacrificed a pawn in the opening but Leko returned it in a couple of moves in an attempt to wrest the initiative. The position looked dangerous for Anand but the Indian Grandmaster defended skillfully to neutralise all threats. The players agreed to split the point after 21 moves in an equal position. Gelfand was the only winner in the sixth round. Defending champion Vladimir Kramnik had to be content with a draw against Levon Aronian and Alexander Grischuk split the point against Peter Svidler. Gelfand played with tactical accuracy and simplified the position with a nice combination on the 26th move. It was plain sailing thereafter and Gelfand pocketed the point in 50 moves. The most exciting game of the day was a wild slugfest between Alexander Grischuk and Peter Svidler. Svidler won a pawn in a complex variation of the Semi Slav defence and allowed Grischuk to dominate the centre. Simi just could not get into her own on the “hurting” greens as she double-bogeyed on the very first hole and got stuck with a triple bogey on the 13th for a five-over card of 77. But the LPGA player still has a round to go and the one-stroke deficit should not come in the way if she gets back some form tomorrow. Chandigarh golf star Irina Brar also just could not find her form on home turf. She was three strokes behind the leader after the second round. The birdies remained elusive as she bogeyed six times for a six-over card of 78. The Jaipur teenaged leader had a birdie on the sixth and was one under till the par-four ninth hole where she lost a stroke for a par first nine. Nitika sank a birdie on the 11th to be one-under. She bogeyed on the 12th to retain the par score. A birdie and a bogey on the next two holes again set her on the par note. But then she bogeyed on the last two holes for a two-over score. The leader group for tomorrow’s final day is comprised of Nitika Jadeja(151), Simi Mehra (152), and Irina Brar (154). Preetinder Kaur of Chandigarh maintained her lead in the Class B professionals. But her performance today was a miserable 13-plus 85. She finished round two with a two-day aggregate of 163. Rukmini Mehta was lying second with an aggregate of 169. Jeev Milkha Singh and defending champion Jyoti Randhawa will be the star attractions in the $500,000 Hero Honda Indian Open Golf Championship to be held at the Delhi Golf Club course from October 11 to 14. The prize money has been hiked by $100,000 as this is the final year of Hero Honda’s three-year sponsorship deal of the Indian Open. Chief of Army Staff Gen JJ Singh, who is also the president of the Indian Golf Union (IGU), said here today that with the participation of Jeev, Jyoti, Shiv Kapur, Gaurav Ghei, China’s Liang Wenchong, who is the leader of the Asian Tour Order and Merit, veteran Australian Peter Senior, 2005 champion Thaworn Wiratchant of Thailand and 2004 title holder Mardan Mamat from Singapore, the field will have an array of top-notch golfers. Champia had beaten Amano Ryato of Japan in men’s recurve individual third place play-off today. He had earlier lost to Korean Park Kyo Moon 112-114 in the semifinals. India returned with one gold, one silver and three bronze from the September 14 to 20 championship, an Archery Association of India statement said. Champia, Jayanta Talukdar and Rahul Banerjee had won gold in the recurve team event, defeating Malaysia 222-219 in the final. They had beaten formidable China 225-223 in the semifinals. In women’s individual compound event, Jhanu Hansdah also won a bronze by getting the better of Malaysian Siti Aisah 110-108 in the third place play-off. Hantuchova took less than an hour to dismiss Russian Anastasia Rodionova 6-2, 6-1. Jose Mourinho’s three-year reign at Chelsea came to an abrupt end today as the Portuguese manager’s fraught relationship with the club’s Russian owner, Roman Abramovich, finally reached breaking point. A terse statement posted on the London club’s website stated: “Chelsea and Jose Mourinho have agreed to part company today by mutual consent. Mourinho had reportedly informed Frank Lampard and other senior players that he was on his way out on last evening and late-night talks at Stamford Bridge concluded with confirmation of his departure. If he wants to go straight into another job, Mourinho will not be short of offers. Sanjo bagged the first place by throwing a javelin at a distance of 43.65 metres. Haryana girl Sonu won the silver (42.72 metres) while Alposad of Haryana won the bronze (41.88). Over 400 boys and 200 girls from 26 states, besides Services and Railways, are likely to participate in the championship. The event follows the National School Championship held here recently. India’s men’s hockey team have been allotted comparatively easier group and ranked at number eight for qualifying tournaments for the 2008 Beijing Olympics. According to Indian Hockey Federation (IHF) secretary K. Jyothikumaran, India will play the qualifying tournaments from March 1 to 9 in Chile and will take on Britain (ranked 9), Egypt (ranked 18), host Chile (ranked 20), Austria (ranked 25) and Bangladesh (ranked 28). Jyothikumaran said that the team would start its preparation for the qualifying tournaments soon and was making plans for it. He said if the Champions Trophy was allotted again to India ahead of Malaysia, the team's preparation would begin from that tournament.